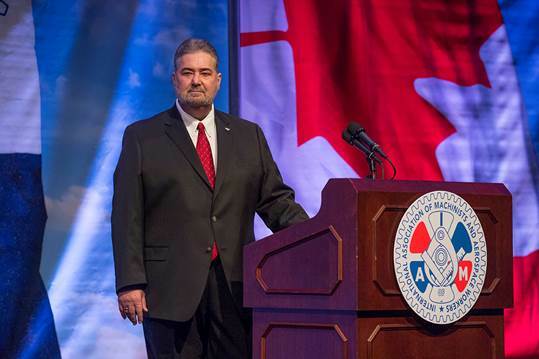 IAM International President Bob Martinez signaled a change in direction for the IAM at its recent staff conference, calling for more emphasis on organizing and unity. The IAM is making structural changes to refocus resources toward organizing and membership services while working to foster a more united culture, says IAM International President Bob Martinez. The IAM’s future begins and ends with growing the organization, said Martinez. Organizing strategies of the past are simply not working anymore. Employers and anti-union consultants have become too familiar with the IAM’s tactics. IAM organizers gathered at the William W. Winpisinger Education and Technology Center earlier in the week to begin formulating a more flexible organizing strategy. “We’re entering a historic journey to change our strategy, our culture and the way we think about organizing,” said Martinez. Martinez says part of that culture change means a tougher stance toward employers who attack the IAM’s membership. He called for an end to long-term collective bargaining agreements without strict job security language. The IAM has put service contractors on notice that the union will fight their bids for government work if they disrespect Machinists at the bargaining table, especially if they’re coming after defined benefit pension plans. The IAM must also fight the rise of GOP frontrunner Donald Trump, who is talking the talk on trade, but is “one of the most anti-union candidates in history,” Martinez said. Trump’s actions speak louder than his words: He exploits cheap labor from Mexico and China instead of keeping jobs in the U.S. Trump would gut or get rid of federal agencies like the National Labor Relations Board and the National Mediation Board and appoint anti-labor officials throughout the government and to the Supreme Court. Social Security and federal workers would have a target on their backs. It’s up to IAM members and their State Councils to ensure Trump is stopped, and that IAM-endorsed candidate Hillary Clinton is elected the next president of the United States, said Martinez. Delegates broke into territorial meetings and gathered to hear more details on political issues from U.S. Legislative Director Hasan Solomon and Canadian Legislative Director Gord Falconer, who it was announced will become Canadian Chief of Staff once Stan Pickthall replaces Dave Ritchie as General Vice President, effective May 1, 2016. “I am not naïve enough to think that this vision of unity and fight will happen overnight, but I am convinced that if we cut costs and refocus resources and assets into a new organizing strategy and new membership programs, that we will grow our great union and put the fight back into the Fighting Machinists,” said Martinez.